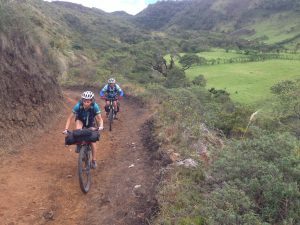 Ecuador it’s the perfect destination for those who enjoy the less traveled roads and bikes. 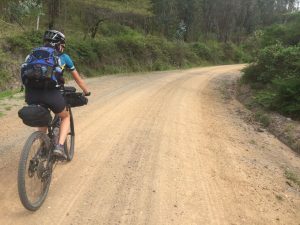 Bikepacking in Ecuador is probably the best way to travel across Ecuador from the highlands to the Pacific Coast through ancient trails and endless gravel roads. 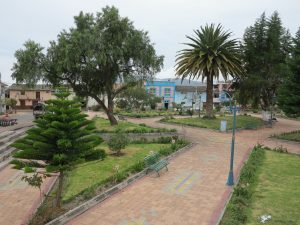 People in Ecuador are very friendly, so you always will find a spot to set the tent and sleep safe or you can find in small villages very humble lodging for a few bucks. 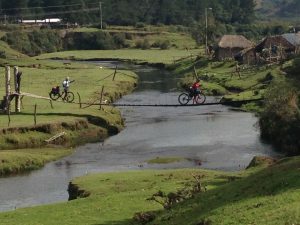 For bikepacking in Ecuador you need a lot of patient due the long uphills to cross different valleys across the Andes. But for sure you will find amazing views of golden grasses called Paramos and Snow peaks. 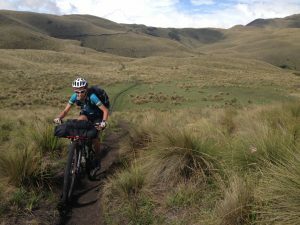 Here is our late bikepacking exploration in the Northern Andes of Ecuador. This first stage is challenging, starts in Cahuasqui at 2.200 mts. Cahusaqui is small village where most of the people are local farmers who produce sugar cane, and some exotic andean fruits such as: tomate de arbol, naranjilla and passion fruits. 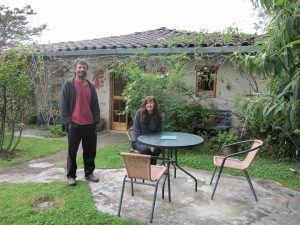 We found Pascal and Nadine, two frenchs who arrive to Ecuador 8 years ago and decided to live a quite live and farmed. They built a couple confortable cabins and run some trekking tours to the Paramo (Highlands) for those who find this magical place. After a nice breakfast with Pascal and Nadine, we prepare our bike and start our adventure. It start from the main square of Cahuasqui and goes to abrupt downhill to 1.900 mts and then start a hearty uphill for the next 20 kms until you reach the highlands at almost 3.700 mts. 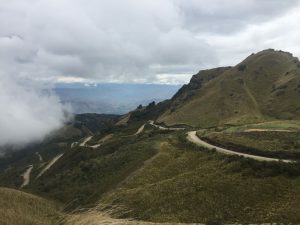 From this point start the descent direct to La Merced de Buenos Aires for another 20 kms passing the Cloud forest until you reach the lowlands. Once you arrive to La Merced de Buenos Aires you can find small stores to buy snacks or local restaurant where you can buy soup and rice with chicken and a fruit juice. We met Rigoberto “Teniente politico of Buenos Aires” who offer us to stay at the upper floor of his office where we set our sleeping mats and our sleeping bags, also he offered a cold shower to recover our muscles after a long uphill who test our legs. The rest of the afternoon we wander around the town and talking with local people about the route that we are going to ride the next day. The original plan it supposed to pedal along the gravel road until Piñan community, but on the map caught my attention a small trail that crosses From Buenos Aires to Hacienda Chinchivi and continues to Piñan community. So, we decide to look for this trail, we cannot miss the opportunity to explore this trail that looked very tempting. As we decided, we began to ride to this unexplored trail that leads to Hacienda Chinchivi on the other side of the mountains. The first 2 kms it’s on a gravel road until we found small road that takes us to the mountains. In Ecuador there is no bikepacking without some pushing bike or better known as Bike and Hike, so from the beginning we had a strong pending for the next 5 kms until we reach the highest point known as Vicente de la Cocha, just a couple isolated indigenous houses that have the best views of the occidental Andes. Once we reach the highest point the trail goes very fast until Hacienda Chinchivi, where meets the gravel road and also the trails continues. We rest a little bit and ask about the next section from there to Piñan. We found a couple Chagras (andean cowboy) that told us that the trail is dry and goes at the same altitute, so again, we decide to take the trail. The trail started right there from Hacienda Chinchivi and leads to a small lagoon named Turococha. It’s a dreamed single track that goes across the highlands. At 18 kms we can see Piñan community from the distance. From this point it’s downhill through an amazing single track. Finally we arrive to Piñan, after 6 hours of pedaling and pushing our bike, there is not too much kilometers but the altitute gain it’s almost 1.500 mts and pushing our bike leave us almost without energy. Luckily, at Piñan community has a small hut where they served excellent meals. Probably the best stage to ride. The amazing views of the Tobar Donoso lagoon are unique, you ride through this single track watching at your left side, the Pitura Valley and on our right side this pristine lagoon. We follow the single track until we reach another isolated village named Guananin. A small village on the edge of the mountain, from there you can watch the Intag valley, our final destination. The descent from Guananin to the Pitura river it’s very technical, halfway we had to unride the bikes and push downhill until we reach the bridge where we found this pristine river pool where we enjoy a refreshing bath before start next uphill to Aguamirla and Irubi. 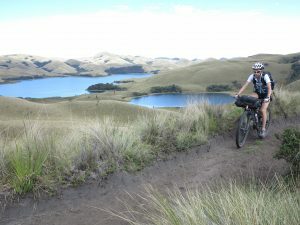 The single track continues until we reach Irubi, small town where we found a small grocery store. From here we hit the gravel road for 10 kms until we get to pavement for another 6 kms that leads us to Apuela. End of the bikepacking.